This tutorial will help you connect your Google Drive to your Bytesized Plex server using Plexdrive. Using Plexdrive you can stream content directly from your Google Drive without having to download it to the server first. Plexdrive setup and running requires certain level of knowledge. Bytesized Hosting does not provide support or will help debugging issues caused by plexdrive. See this news item for more details on why that is the case. Plexdrive is read-only, use rClone for uploading files. Never ever mount on your home folder (This includes ~ or $HOME or an absolute path to your home folder.) This will break your whole box. We don't support direct connections of your apps to the mounts that you made because connecting your apps directly to the mount can make that app highly unstable. If your apps stop responding, you will have to troubleshoot the issues yourself. 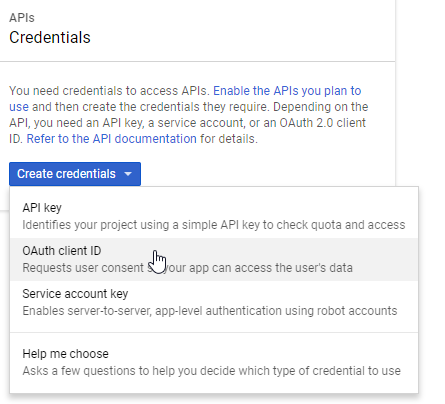 Before you can proceed with creating the API, you are nagged to Configure consent screen, so click that. Type a description (Plex would do) and hit Save. Select Other under Application type and give your API an appropriate name, such as Plex. Then click Create. You will be given your own client ID and client secret which you will need later on so make sure that you don't close the window containing your Client ID and Client secret. You will be asked to provide your generated client ID. This is the Google client ID you created in previously. The codes are probably still sitting on your screen. Copy/paste it and press enter to continue. Do the same with the generated client secret, If you had closed your browser after all, head back to https://console.developers.google.com, click Credentials, and click Edit behind the API you created. This will show you the OAuth information again. You will now be asked to paste a link in your browser. Paste this link in your Browser. You are asked to authorize Google drive and will be given an authorization code. Copy/past that code into your Terminal/Kitty . If all goes well, Plexdrive will start generating the cache. This will take a long time, but thanks to the separate screen we do not have to wait till it is completely finished. I do suggest waiting a few minutes until it mentions that it finished the initial scanning. Once the cache creating process slows down to 1 or 2 items at the time, you can safely detach the screen . To detach from the screen press Ctrl-A, then the letter D.
Restart your Plex, once restarted go to your Plex and add a new Library. Name it whatever you want. In my example i will name it Plexdrive and my folder for movies on Google Drive is called PlexdriveMovies. After you have set the path , press Save changes and then run the scan of the library and you're ready to go. What's handy about these scripts is that in case a server that you're on reboots , your Plexdrive will be automatically started(mounted). Save the file by using the keys ctrl + o from your keyboard and then close the file by using ctrl + x. Once you have setup the startup/shutdown scripts you just need to type ~/.startup/plexdrive if you want to start Plexdrive , or~/.shutdown/plexdrive if you want to stop Plexdrive. If during the configuration you make any issues and Plexdrive is throwing "Transport endpoint is not connected" errors you can usually get rid of that by using fusermount -u ~/mnt/plexdrive and then trying to connect again. You will have to restart Plex after the drive is mounted in order for Plex to be able to recognise the files.